Are you the type to celebrate holidays with lots of spicy foods to stimulate your taste buds? Hot chili peppers can add a little extra flavor and kick to any meal. Fiery spices have some benefits to your body, but you should beware of dangers to your smile, including burning mouth syndrome. Before you set of the fireworks outside, have you already had some going on in your mouth? Spicy foods act like a stimulant, waking up your body. Capsaicin is the ingredient responsible for the burning feeling that stimulates your nerve endings. When you bite into a chili pepper, your eyes begin to water, your mouth burns, and your body becomes more alert. The painful burning is actually waking up your senses and triggering your appetite. Hot peppers can produce a burning sensation on the mucous membranes inside your mouth, lips, or tongue. In extreme cases, they may even cause blisters. As an instant response to the fire, your mouth triggers more saliva production to help rinse away the stinging feeling. For people who suffer from dry mouth, the burning can be extra painful because there is no saliva to help moisten the burn. Also, if pepper juice squirts into a decayed pit in your tooth, it could reach the nerve endings inside your tooth and cause a sharp tooth pain and sensitivity. Burning mouth syndrome on a chronic bases requires dental attention. Spicy foods may also contribute to bad breath. They leave a film of spice on your tongue and odors in the back of your mouth that are released when you exhale. If the pepper is in powdered spice form, it could stick on your teeth and tongue and even cause stains. Peppers make your mouth feel like it’s on fire, and it can be difficult to quickly remove the smell and taste. Many people try to put out the burning fire by drinking water. Liquids will spread the capsaicin to other parts of your mouth and make the pain worse. Instead, try eating an absorbent food like bread to soak up the spice. There are good qualities to spices, however. Studies have shown that capsaicin pepper spices can also reduce some cancer cells in your body, prevent gastric acid damage, boost your metabolism, stimulate circulation, and burn fat. Be careful, though, because peppers can leave you with an uncomfortable feeling of heartburn and indigestion. 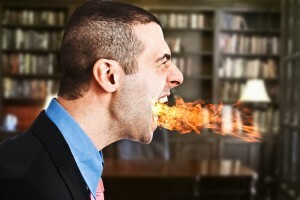 If you mouth seems to be on fire all the time, for no explainable reason, Dr. Young can treat burning mouth syndrome. Contact our dentist office in Lafayette, Louisiana, at (337) 237-6453 to request an appointment.